Do not hesitate to contact us for any project. It is in 2001 that Lucien Marin began the creation of his company: "MULTI SERVICES SYSTEME" in Nyons. 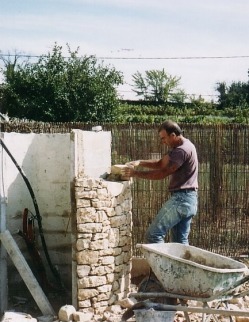 Stone work in particular has no secret for him. However, his biggest passion is undoubtedly the creation of gardens. He can thus realize what in your thoughts was but a simple dream (fountains, sculptures in the rock, wooden huts, tiled floors, waterfalls...), and add his personal touch to make your garden magnificent and completely unique. You dream of a particular garden but you don't have a precise idea of what you want? No realization is impossible : Lucien is going to imagine this garden from the conception of the plan to the final realization.